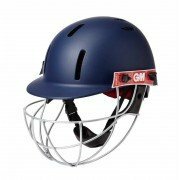 Have the protection you deserve with GM Cricket helmets. In today's world the helmet is a must have item to give you the comfort and safety factor you expect throughout the season. Proudly worn by New Zealand Batsman Ross Taylor. Quality merchandise at affordable prices as always from All Rounder Cricket.